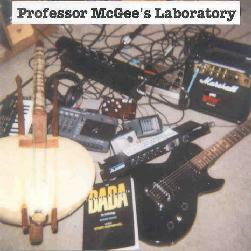 Hal McGee - "Professor McGee's Laboratory" / "American Primitive" / "Possibilities"
Professor McGee's Laboratory is a sound art and collage of every-sound-under-the-sun work that will appeal to fans of Hal's My Brain, Wired For Sound, and similar recordings. The CD consists of 5 tracks of almost identical 15+ minutes length, in which Hal does his patented tape recorder as compositional tool thing. "Grumbits Saliwanchik Topassout" is an electro-acoustic sound collage piece with a Macy's Day Parade full of percussion, strings, accordion, and the usual Hal melee of field recordings that include the sounds of the city and countless other sounds and assorted voices, including his own musings. My favorite parts are where we've got an all-you-can-eat banquet of sounds, music and talking, while the accordion serenades us as if we were having a candlelight dinner in an Italian restaurant that doubles as a performance space. Fun huh? It is! Another highlight segment is where a dissonant Oriental styled guitar pattern fills the lulling accordion role while Hal chats and dense noise waves create a harsh sonic backdrop. We get a similar effect from the piano during a section on "Documentation & Illustration Of My Present Tendencies", which brings a bit of peaceful bliss to a track that includes some of the harshest and most chaotic moments of the set (dig that acid rock guitar). Of course the piano doesn't stay peaceful for long and we later hear bits of the maddened concert pianist sweating with passion as he attacks the keyboard. I have a fondness for Hal's works that emphasize the sounds of the urban landscape, and "Swamp Operetta With Cricket, Pianoette and Theremin" and "Nothing Else Smells Quite Like It" are characteristic of this area of Hal's sound art compositions. On Swamp Operetta we ride along with Hal as he chats with folks on the bus on the way to his destination. Very much a hangin-with-Hal piece, we journey along hearing every subtle sound that accompanies the ride... conversations, outside traffic, work crews, kids playing, etc... things we probably wouldn't even take note of if we were out and about in the city ourselves. And of course there's plenty of electronics, theremin and pianoette (courtesy of Brian Noring), more of that Oriental sounding guitar, and general sonic aggression coloring the proceedings, as if to create a musical interpretation of the real life activity it accompanies. "Nothing Else Smells Quite Like It" has a similar focus on city life, but also includes a steady stream of Hal's spoken word poetry. I got a kick out the part where Hal is bewildered over why his shoes keep coming untied and wonders if it might mean anything. See how wrapped up you can get in the details!! And it may be no coincidence that immediately after the part about his shoes we hear Hal talk about how he has endeavored to "develop recording and compositional techniques designed to open up pathways of exploration for the listener". The path Hal has opened offers a wide berth and lays out a warm, fuzzy welcome mat. The rest is up to the listener, the challenge perhaps being not so much the nature of the recording itself as the willingness of the listener to climb aboard and let his/her own perceptions and subjective experience of Hal's work be the guide. 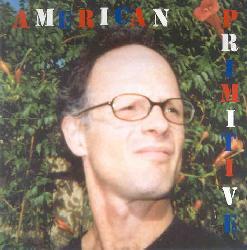 American Primitive is something of a McGee family collaboration. We've got Hal employing his usual arsenal of gear, accompanied by Mark McGee on bongos and voice, Evan McGee on Casio and voice and Kyle McGee on keyboards and voice (along with more voice by "Waldo"). The CD consists of 2 lengthy works. The 31 minute "Radicals vs. Guardians" is a roller coaster ride sound art piece with concert-pianist-gone-mad ivory tickling, brain shattering noise tones, the trademark Hal glom of voices and, of course, a potpourri of clattering and musical sounds. As a whole this is among Hal's harshest works. But I really like the piano style which injects a frantic pace and even a feeling of a groove to the proceedings... which is pretty wild running the course against all the mayhem going on around it. It's a startling contrast and my head was spinning by the end of this half hour of sonic destruction. There's lots of dense high volume stuff to be sure. But even at its most aggressive I was aware of all the separate elements that made up the whole, as opposed to it all just being a giant meganoise wall of sound. I do get stuff like that sent to me and it just isn't very interesting. I don't mind my senses being tortured. I like it sometimes. And indeed Hal gives us plenty to dwell on and consider as we clutch white knuckled to the tree trunk, watching the wreckage and debris blowing by and waiting for the hurricane to subside. After a breather and a restoring cup of tea I felt sufficiently bucked up to put on the headphones and dive back in to tackle track 2, the 47 minute "Equal-Opportunity Chaos". Having survived the wrath of "Radicals vs. Guardians" I was feeling much like Evil Knieval must have when he was nearing the milestone of having broken every bone in his body. Bring it on... ya can't hurt me... in fact, I welcome it. Chaos is very much what this piece is about, though Hal is clearly in control. And while this is very similar to "Radicals vs. Guardians" in terms of the chaotic collage like nature of the piece, it's far less aggressive and won't shatter nearly as many of your neurons (though it's by no means light listening). It's a full banquet of avant-garde free-improv music, freaky alien electronics and aural fingerpainting. Much of it is surprisingly "musical". Lots happening here... lots of treasures to mine. And speaking of musical... 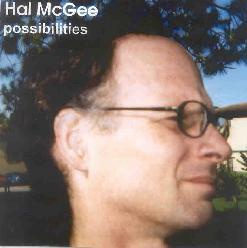 Possibilities is an album that came as a pleasant surprise and I would never have guessed it was Hal. The album consists of 50 solo piano pieces, mostly played in a style similar to that heard on Professor McGee's Laboratory and American Primitive, though of course with everything else going on I only focused so much on the piano on those CD's. But hell, Hal can really play. The music has a composed feel, being played in a concert piano style that is highly accessible, though by no means mainstream. At times we hear the wild eyed passionate concert pianist, and at others Hal has the light melodic touch. The music is thoughtful and highly expressive. Quite nice hearing this purely musical side of Hal. For more information you can visit the HalTapes web site at: http://www.hometown.aol.com/haltapes1/index.html.